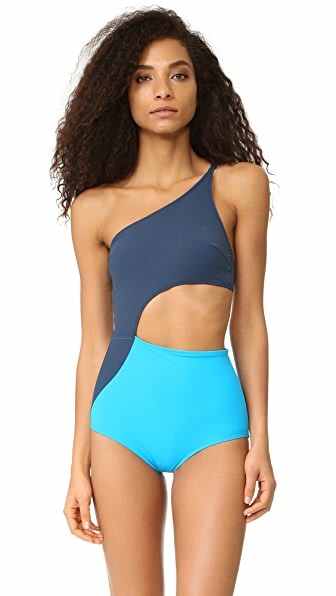 A wraparound cutout separates the single-shoulder top from the high-waisted bottoms on this colorblocked Flagpole swimsuit. This is the second one I've ordered. Hook-and-eye back closure. I am short so it comes a bit longer. Lined. The color is deep blue, bright and a bit shiny. 72% polyamide/28% elastane. The Purple is very vibrant and styley. Wash cold. I plan on wearing this so much! Made in the USA. The slit may come to your knees, that is where mine stopped at. Imported fabric. Over all, a beautiful, quality garment for a good price. This entry was posted in Reviews and tagged Flagpole Clothing > Swimwear on by Better.